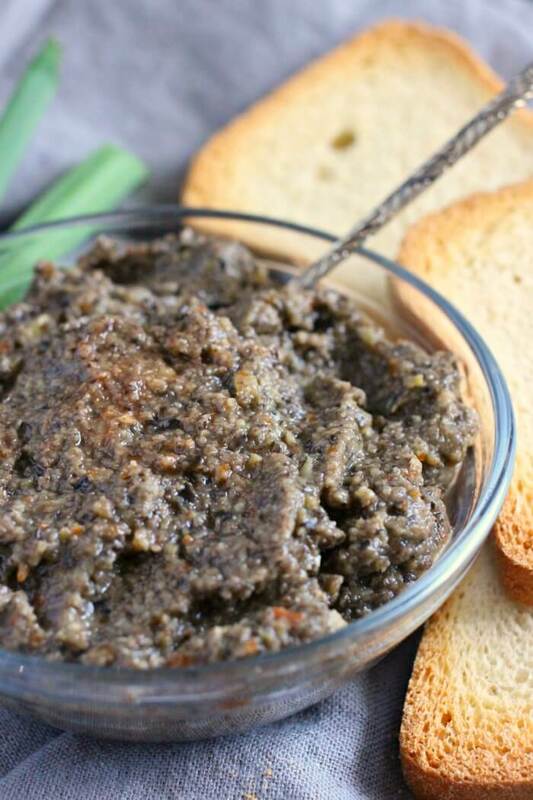 Olive Tapenade takes your appetizer spread up a notch! 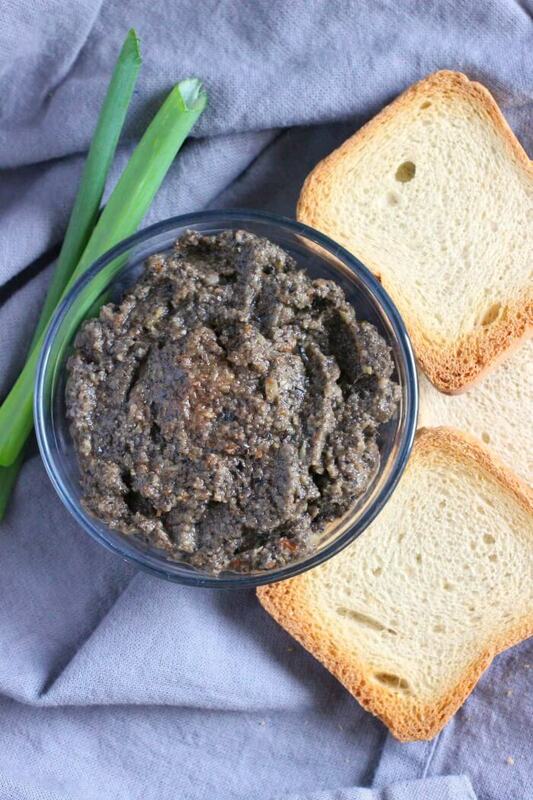 Olive Tapenade is one of my favorite yummy spreads that I make when we have friends over. My boys and husband are not olive fans, so I am only able to make this when we have company. Otherwise Josie and I would eat the whole thing. Yum. Yum. Yum. 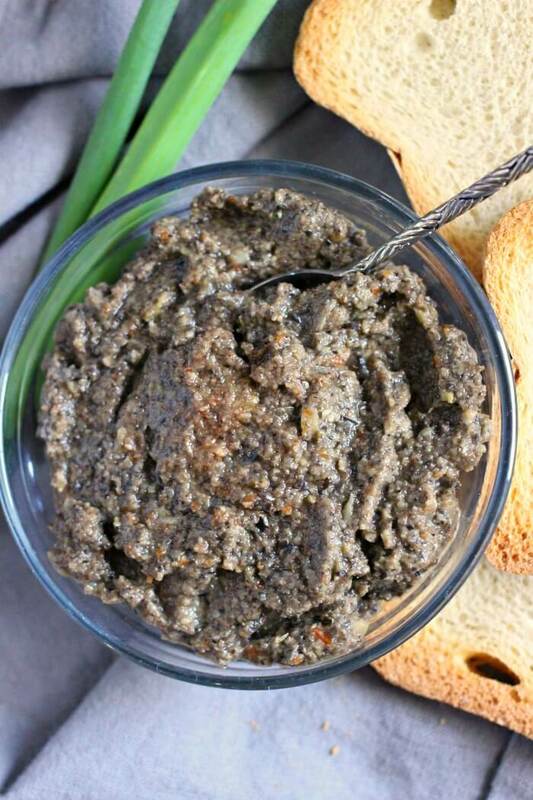 My Olive Tapenade recipe is super fast and easy, so you can whip some up in a jiffy! Put it on a table spread with our cracker recipe, crudites, and other spreads and dips, like my spinach dip. And definitely add it to your next cheese board! Black Olives – Make sure that they are pitted, and drain them if canned. Green Olives – I like to get the type stuffed with pimentos because the pimentos add a nice flavor and color to the mix! Garlic – Not only does this up the taste, it also ups the nutrition. First, add the olives and garlic to a blender or food processor. Next, blend to your desired consistency (chunky or smooth). Then, serve with crackers, spread on your sandwich, or dollop onto fish, steak, or chicken. Finally, share the salty goodness with your friends and family! We’re covering all your questions about olive tapenade. If you think we missed something, comment below! Olive Tapenade comes from the Romans, originally. 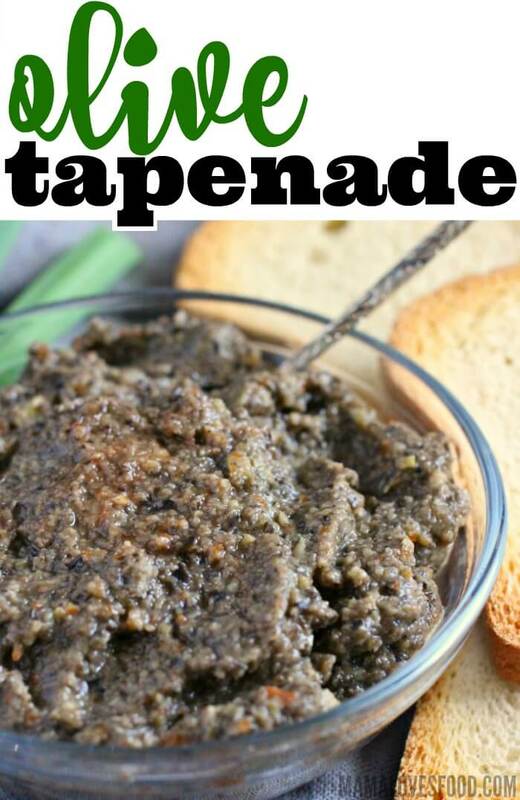 The word tapenade is actually French, from the word for capers. Although I don’t add capers to my Olive Tapenade, many do. If you want to up the saltiness and umami even more, toss a few capers into your mix! Olive Tapenade tastes salty. It is slightly reminiscent of caviar, but with more umami and no fishy flavor. Some recipes add anchovies and capers to up the saltiness without it tasting fishy (did you know sardines don’t taste fishy!). I like mine simple, just olives and garlic! 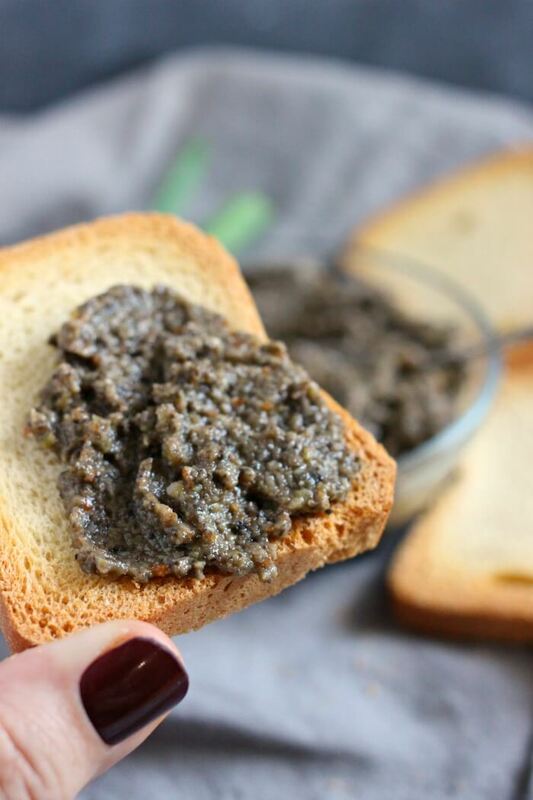 Olive Tapenade is good for you! Olives (both green and black) are high in monounsaturated fats and have minerals like iron and copper. Olives are also contain vitamin E and other phytonutrients that act as antioxidants. Both green and black olives are healthy, and have the same nutritional value. Olives are high in monounsaturated fats (the good kind!) and are full of vitamins and minerals. Garlic is high in a phytonutrient called allicin, which is linked to better heart health, and antioxidants which are linked to a lower risk of cell damage and aging. The difference between olives depends on when they are picked. Green olives are picked before they are ripe, while black olives are allowed to ripen on the tree. They are processed similarly, with green olives often pitted and stuffed with pimento or other items. You can eat Olive Tapenade when pregnant, although some recipes use anchovies, which can be off putting in the first trimester. The combination of olives and garlic should present no problems, though you should always partner with your obstetrician if you have any concerns. Olive Tapenade can be pretty salty, so be careful if you are retaining fluid with your pregnancy. 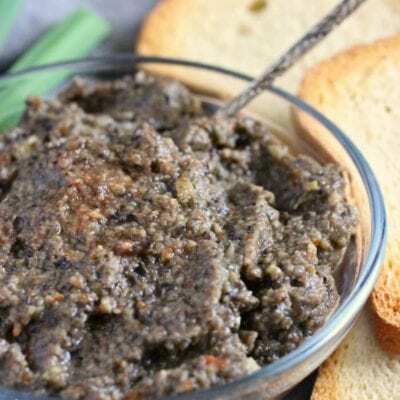 Olive Tapenade is used as a dip or a condiment. It can also be used to spoon over meat dishes, like fish or beef. I even love to spread it on my grilled cheese for an extra boost of flavor! Want to make a pretty appetizer for your spread? Stuff some tapenade into a cherry tomato and top with a bit of feta cheese! There are so many ways to make Olive Tapenade, and it’s a fun recipe to play around with to your tastes. Here are the answers to some questions you had! You can substitute red peppers to make a red tapenade. Because the peppers do not contain oil like olives, you will want to add some olive oil (or perhaps an avocado oil, if olives are really off the board). There are so many ways to make Olive Tapenade, and it’s a fun recipe to play around with to your tastes. Here are some questions y’all had! To make a black olive tapenade, simply leave out the green olives. Because the green olives add saltiness, you may want to add some capers to the overall blend. You may also want to add some olive oil for consistency. Yes, you can substitute kalamata olives for the black olives in tapenade. This will probably be even more flavorful! You can make Olive Tapenade without a food processor by chopping all the ingredients then blending or mashing with a potato masher. You will get a chunkier tapenade, which some people actually prefer! Olive Tapenade is good in the refrigerator for at least 3 days. Keeping it covered with a bit of olive oil on the top helps prevent spoilage. You can freeze Olive Tapenade. Be sure to leave headspace, as the olives will expand. Allow to thaw in fridge when ready to use, within a few days. Olive Tapenade is keto. Add to crudites, like celery or cucumber slices, or spoon over fish dishes. 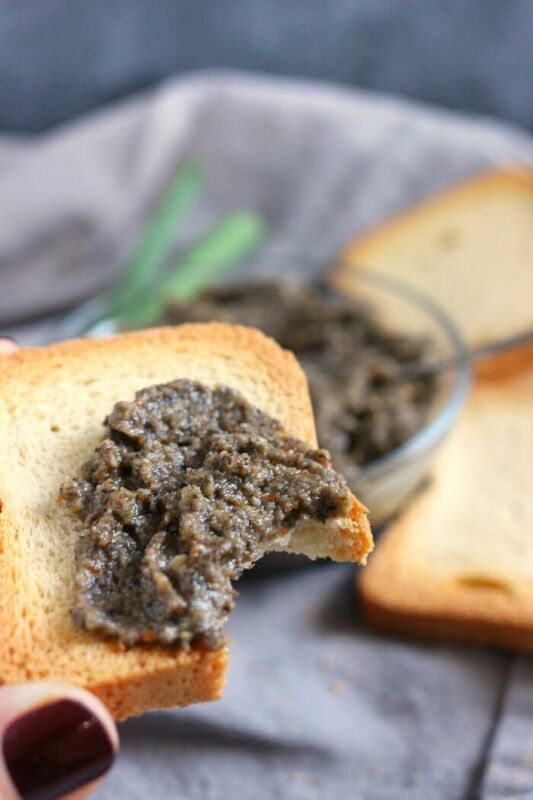 Olive Tapenade is vegan, as long as anchovies are not added. My recipe contains all vegan friendly ingredients. Olive Tapenade is paleo. Add to crudites, like celery or cucumber slices, or spoon over fish dishes. 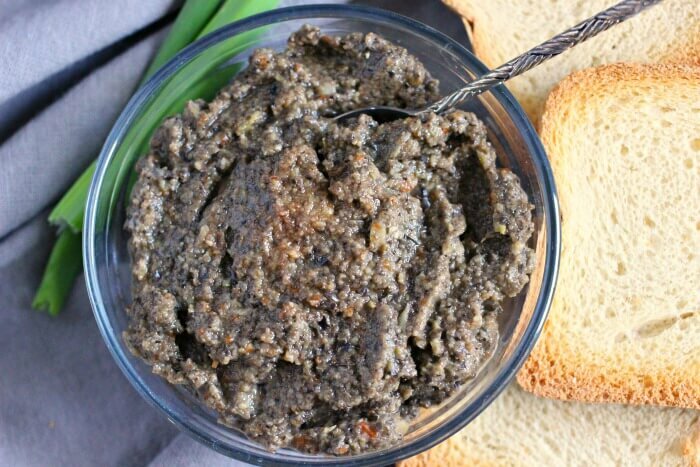 Olive Tapenade a great appetizer option and is one of my favorite spreads to make when we have friends over. EVERYONE WANTS THIS RECIPE! Combine olives and garlic in a blender or food processor and pulse until desired texture is reached. Serve with crackers, chips, toast, crudites, or on prepared meat. Sounds wonderful. I love olives, my kids not so much. Oh, wow! These recipe is fantastic! I'm so glad I saw this link. making this alone with the tomato soup tonight.